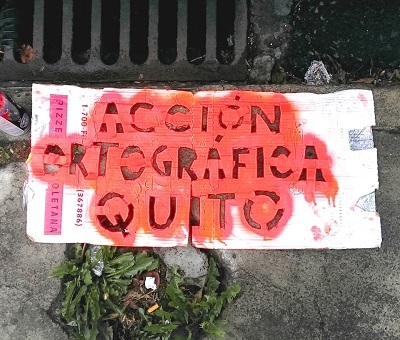 Jonathan Watts’s March 5 article in The Guardian, reposted by Cuenca High Life, brought my attention to Acción Ortográfica Quito, or “Quito Orthographic Action”. These guerrilla grammarians have been taking to the streets of Quito with cans of red spray paint to correct the appalling grammar and spelling of the city’s ever-present graffiti. As a former language teacher and long-time linguist, when I read about Acción Ortográfica Quito I couldn’t help myself from smiling at the irony of what they are doing. In my view, the group is performing a valuable public service by turning vandalism into a public service announcement on the improper use of the Spanish language. While the original authors of the graffiti may not appreciate their political statements or professions of love or heartbreak being turned into public grammar lessons, Acción Ortográfica is raising awareness of the fact that even the most important messages can be lost when language is not used properly. Acción Ortográfica’s work to promote the proper use of Spanish in public spaces in Quito might inspire vigilante English linguists to promote proper English translation. Here in Cuenca, we are also plagued with poor quality English translation that is often more likely to confuse than it is to inform. While my colleagues and I will probably not start running around the city with cans of red spray paint to correct signage with abhorrent English translation any time soon, we might be more inspired to correct poor English translation with an eye towards doing a public service. All of the images appearing on this page were taken from Acción Ortográfica Quito’s Facebook page, here, here, and here.